Kick diet culture to the curb with the simple process of intuitive eating. Intuitive eating is the un-diet; the commitment to no longer participate in diet culture. Intuitive eating is quite simply, eating. No restrictions, no calorie or macronutrient counting, no judgements. Those who use intuitive eating re-learn to connect with their body’s hunger cues, to honour their hunger and most importantly, their health. In their book Intuitive Eating: A Recovery Book for the Chronic Dieter, dieticians Tribole and Resch identify three essential components of intuitive eating: a) permission to eat a desired food when hungry, b) reliance on hunger/satiety cues for determining when and how much to eat, and c) eating for physical, as opposed to emotional reasons. A study conducted at Ohio State University (Tylka, 2006), studied these three factors and found consistent and stable results, supporting their validity. 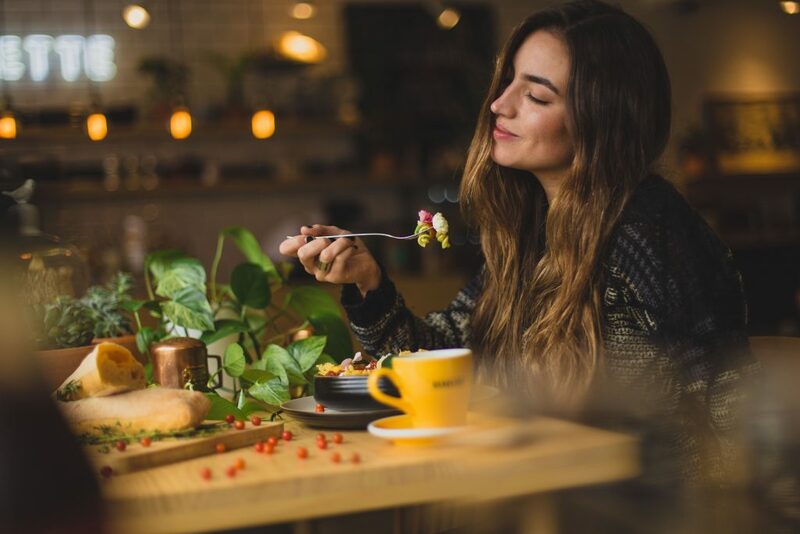 This study also found women who practiced intuitive eating, were not only leaner, but also had a healthier relationship with food and their body, than their diet-following counterparts. Reject diet culture and labelling food as “good” or “bad.” You’re free to eat what you want whenever you are hungry. Re-connect with and honour your hunger. If you are hungry, eat. If you are still hungry, have more. If you aren’t hungry, don’t eat. When you are full, stop eating. Declare a truce and make peace with food and your body. Take pleasure in your food. Enjoy what you are eating, be it carrots or cake. Be present in the moment, eating mindfully and with gratitude. When you feel like eating for emotional reasons, embrace the discomfort and sit with your feelings instead. Respect and love your body! This includes nourishment and pleasurably challenging exercise as well as self-care practices. Prioritize your health—mentally, spiritually and physically. Live as if you love yourself, you know your worth, you value yourself. Live as if until you really do. Intuitive eating will challenge you—embrace the challenges and learn the lessons they are meant to teach you. Be patient and kind with yourself. This is an intuitive eating practice—you won’t be perfect, you will doubt, you will struggle, you may be tempted by the lure of diets again. Trust the process and remember your health and happiness are more important than how you look. Ali Whyte is a writer and wellness coach. Her philosophy is that by living today well, we create lives we love. Through her writing and wellness workshops she helps inspire and empower others to live each day incredibly well.